What happened with Linda? 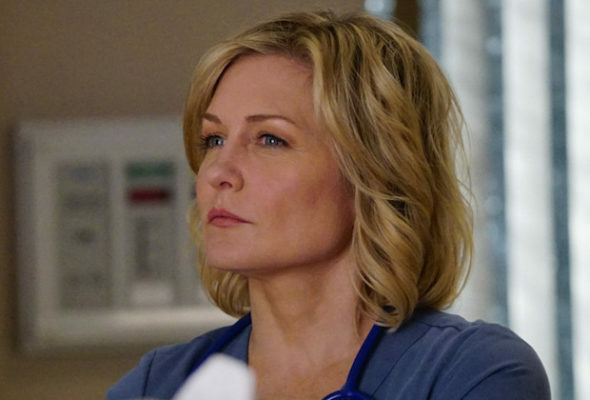 Recently, Amy Carlson spoke with Deadline about her shocking exit from CBS’ Blue Bloods. Carlson played Linda Reagan, the wife of Donnie Wahlberg’s Danny, on the cop drama. The cast also includes Tom Selleck, Bridget Moynahan, Will Estes, Len Cariou, Marisa Ramirez, Sami Gayle, and Vanessa Ray. WARNING: BLUE BLOODS SPOILERS AHEAD! When Blue Bloods premiered its eighth season in September, it was revealed that Linda (Carlson) had died in a helicopter crash. The character death prompted a vocal reaction from fans, who were shocked by the clumsy way the writers handled Carlson’s exit from the show. What do you think? Do you watch Blue Bloods? How do you feel about Linda’s death? More about: Blue Bloods, Blue Bloods: canceled or renewed?, CBS TV shows: canceled or renewed? I don’t know what the purpose was to kill off Linda and leave Danny a single father with 2 kids while he is trying to fight crime. Linda was a good addition as a nurse who brought in a nice variation at the hospital from time to time and kept Danny on the straight and narrow. I think CBS made a big mistake when they did that and caused Blue Bloods to loss position in the ratings. Husband and I both have watched Blue Bloods from the start! We hate to think of this show not coming back! Seasoned actors and younger, as well. Makes for a great and realistic family structure. Ethical and unethical behaviors and issues are addressed in scripts. I like that Jamie and his partner have a real romance that has developed! Where is that going to go? I want to see this show stay. Seriously one of the better “cop” shows on tv. This is one of my favorite TV shows. The cast is excellent. I was disappointed that Linda died, but it did make Mr. Wahlberg’s role more challenging.